It's surprising how nervous I felt posting that Moro bread recipe, and then my iffy conversions from metric. What if I made a typo or mistake? People might take the time and effort to bake the bread and it would be bad and it would be all my fault. I don't know how cookbook writers sleep at night. Apparently, they don't. I just read this in supereditor Judith Jones's sweet, smart blog, which I discovered via Bookslut. 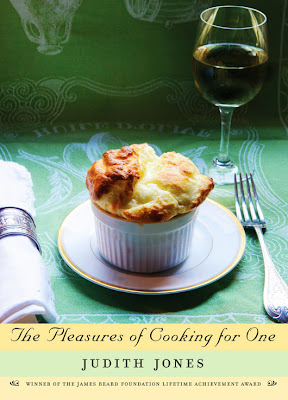 I convinced my father to buy Jones's Pleasures of Cooking for One after reading a warm review, also in Bookslut. Dad, make note of Jones's "errata" before you attempt the blanquette de veau or Sauce Gribiche. I want that book for myself, but this really isn't the time. What do you mean, this isn't the time? When are you expecting the right time to be cooking for one? Good post and this mail helped me alot in my college assignement. Thanks you on your information.